Our section on theology will focus on the Gaudiya Vaishnava school's concept of Divinity in His infinite aspects, culminating on its ultimate object of worship, the Divine Couple, Radha and Krishna. Some of the descriptions found on this page are kept rather concice in fear of increasing the bulk of the presentation, and will be more elaborately discussed in separate essays found on the [resources] page. Learned men understand the Divine to manifest in three aspects, which are known as His all-pervading formless aspect, His aspect as the Lord of the heart, and his aspect as the Supreme Person. (1) Brahman (the All-pervading Spirit): The non-differentiated aspect of the Divine is known as Brahman. This all-pervading spiritual substance is known to be the support of all the worlds, and whatever exists is known to be of Brahman only in its various manifestations. Brahman is understood to be the halo of the Supreme Person. (2) Paramatma (the Supreme Soul): The localized aspect of the Divine is known as Paramatma. Known as the Lord of the heart, this aspect of the Supreme has expanded within the hearts of all living entities, invoking inspiration, knowledge and forgetfulness in them. He is the silent witness in our hearts, the impartial overseer and permitter of everyone's activities, and the one who keeps the world turning in accordance with the deeds of all living entities. He is an expansion of the Supreme Person for the maintenance of the cosmic manifestation. (3) Bhagavan (the Supreme Person): The ultimate aspect of the Divine is known as Bhagavan. He is simultaneously transcendent and immanent, being situated in His own divine realm and simultaneously pervading everything through His infinite manifestations. This Supreme Person is the ultimate master, friend, father, son and beloved of all living entities. In His kindness, He manifests to everyone in accordance with their desires to serve Him, while remaining at the same time in His supremely attractive form of Sri Krishna, in whom all beauty and love find its pinnacle. An ancient prayer in Brahma Samhita says, "I worship Govinda, the primeval Lord, whose non-dual, perfect and eternal forms are unlimited, who is the original ancient person, yet in his blossoming youth, and who is beyond access for the Vedas, but very near to those with a pure, devoted heart." The original Supreme Person, Krishna, expands into various forms to fulfill various purposes within His creation. He is known as Svayam Bhagavan (the Supreme Person Himself) and Lila Purusottama (the Supreme Enjoyer of Pastimes). To taste the full variety of loving exchanges with His devotees, He manifests various forms in both the material and the spiritual worlds. Within the spiritual world, the Lord manifests Himself in His original form, in multiple forms with identical characteristics (such as in the rasa-dance and in the palaces of Dvaraka), as well as in multiple forms with different moods and characteristics (such as His brother, Balarama), which include the unlimited four-armed Vishnu forms pervading the vast spiritual sky. (1) Lila-avatara (pastime descents): These forms of the Lord have very distinct features, and they enact unparalleled activities in this world. Some of them are Ramacandra (the ideal king and ruler), Narasimha (half-man half-lion form who saved His devotee Prahlada), and Matsya (the fish-form who swam in the waters of devastation). (2) Purusa-avatara (descent for creation): There are three forms of the Lord particularly meant for the maintenance of the cosmic manifestation. They are (1) Karanodakasayi Vishnu who manifests all the universes, (2) Garbhodakasayi Vishnu who presides in each universe, and (3) Ksirodakasayi Vishnu, who presides in the hearts of all living entities, and is also known as the Paramatma. (3) Guna-avatara (descents for controlling the modes of nature): There are three forms of the Lord meant for controlling each of the three modes of nature, namely goodness, passion and ignorance. (1) Brahma, who is generally an empowered living entity, is in charge of the mode of passion, and takes care of creation. 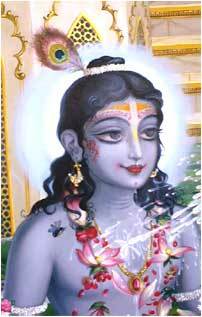 (2) Vishnu is in charge of the mode of goodness, and takes care of maintenance. (3) Shiva, who is a transformed form of the Lord, is in charge of the mode of ignorance, and takes care of destruction. (4) Saktyavesa-avatara (descents endowed with potency): When the power of the Lord for fulfilling a particular purpose is bestowed to a living entity, he is known as a saktyavesa-avatara. The powers bestowed are the power to teach divine wisdom, the power to instill devotion into others, the power to rule the world, and the power to create, among others. They are further divided into those who are directly empowered by the Lord and those who manifest a reflection of the Lord's potency. (5) Manvantara-avatara (descents for the era of Manu): There are fourteen Manus who rule the humanity during each cosmic day of Brahma, and during each era there is a form of the Lord who descends to this world. The Lord's fourteen descents are known as Yajna, Vibhu, Satyasena, Hari, Vaikuntha Ajita, Vamana, Sarvabhauma, Risabha, Visvaksena, Dharma, Sudharma, Yogesvara and Brihadbhanu. Additionally, each Manu is a descent of the Lord. (6) Yuga-avatara (descents for the age): There is a form of the Lord who descends in each of the four ages in the cosmic cycle of time, known as Satya, Treta, Dvapara and Kali-yugas. The Lord descends to teach the method of religion relevant for the particular age. Please view a diagram of these manifestations to get the complete picture. Considering the various manifestations of the Supreme Person from the point of view of ontological truth, they are nondifferent from each other, being manifestations of the Lord. However, there are definite differences between His various manifestations in terms of the taste experienced in loving exchanges with Him. (1) Santa-rasa (neutrality): When love for the Supreme is experienced upon beholding His glory, without experiencing a particular impetus for engaging in His service, the relationship is known as santa-rasa. (2) Dasya-rasa (servitude): When love for the Supreme Person is experienced either as the reverence and submission felt by a servant towards his master, or as the respect and esteem that a son feels for his father, the relationship is called dasya-rasa. (3) Sakhya-rasa (friendship): When love for the Supreme Person is experienced with feelings of intimacy and equality, devoid of the sense of obligation felt by a servant, the relationship is called sakhya-rasa. (4) Vatsalya-rasa (parental love): When love for the Supreme Person is experienced as His dependence upon the devotee's nourishing, blessing and looking after Him, the relationship is called vatsalya-rasa. (5) Madhurya-rasa (amorous love): When love for the Supreme Person is experienced as feelings of amorous love, as experienced between the lover and the beloved, or between the husband and the wife, the relationship is called madhurya-rasa. Each subsequent relationship has more attributes and an increased feeling of intimacy. To facilitate the compatible existence of various relationships with Him, the Lord manifests His different aspects in different regions of the spiritual sky. The spiritual sky is understood as having multiple regions wherein the Supreme Person manifests His pastimes in the company of His loving devotees. The progressive supremacy of these spiritual regions is determined in accordance with the degree of intimacy of love. To comprehend the hieararchy of the various regions, we need to accustom ourselves with two basic concepts: (1) aisvarya (supernatural might and opulence), and (2) madhurya (natural sweetness and intimacy). (1) Aisvarya: The Lord's exhibition of supernatural might and opulence which causes a feeling of fearful awe and reverence in the heart of the devotee, is known as aisvarya. (2) Madhurya: The abundant sweetness of human-like relationships with the Lord, which covers any considerations of His Godhood under the veil of loving intimacy, is known as madhurya. The more intimate and independent of the status of the object of love the love is, the more complete it is understood to be. Therefore gradations of perfection among the Lord's various features are measured on the scale of the presence of madhurya. (1) Vaikuntha: In Vaikuntha, the Lord is present in His four-armed Vishnu-forms, manifesting His supernatural opulences. The devotees in Vaikuntha-region serve the Lord filled with awe and reverence. Here the Lord is known to be complete. (2) Dvaraka and Mathura: In Dvaraka and Mathura, the mood of devotion is a mixture of alternating reverence and sweetness. Here the Lord is known to be more complete. (3) Vraja: In Vraja, the mood of devotion is of pure sweetness, and even the Lord's display of unparalleled majesty does not diminish the natural love of His devotees. Here the Lord is known to be most complete. When Sri Krishna descends to this world, He manifests three ages: (1) childhood, (2) boyhood, and (3) youth. The first period of five years is filled with pastimes of parental love, the second with pastimes of friendly love, and the third with pastimes of amorous love. This enchanting form saturated with carefree blossoming youth is considered to be the perfection of His being, and the most attractive among all of His forms. Though the various forms of the Lord are analyzed and hierarchically presented, there is certainly no fault in any of them. They are all eternal, filled with knowledge and ecstacy, and perfect in their position of enabling His experience of the full spectrum of loving interaction. 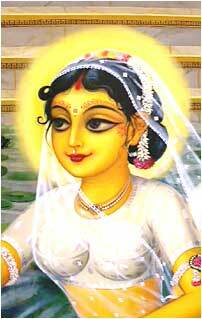 The divine counterpart of Sri Krishna is known as Sri Radha. Sri Radha is the complete energy, and Sri Krishna is the complete source of energy. They are nondifferent from each other, just as musk and its scent are inseparable, or as fire and its heat are nondifferent. Just as Krishna expands Himself to Dvaraka and to Vaikuntha, so Radha expands along with Him to assume the forms of the Queens of Dvaraka and the Laksmi-goddesses of Vaikuntha. The cowherd maidens of Vraja are manifest from Her being to expand the relish of amorous adventures. Radha and Krishna are one, yet They have assumed two separate forms to enjoy loving pastimes. She is Krishna's own divine potency who accompanies Him in His pleasure sports, being thoroughly imbued with and consisting of love for Him. Since Radha is filled with all divine qualities, She alone is able to fulfill all the desires of Krishna. "May that Sri Krishna, son of the king of the cowherd men — whose effulgent bodily complexion defeats the luster of a fresh monsoon cloud, collyrium and sapphire, whose yellow cloth is more effulgent than kunkuma, the rising sun and a flash of lightning, and whose entire form is anointed with sandalwood paste mixed with camphor and saffron — bestow upon me the service of His lotus feet! May that Srimati Radhika — whose bodily complexion snatches away the pride of a golden lotus flower tinged with kunkuma, whose bodily fragrance reproaches the fame of a fragrant lotus sprinkled with saffron powder, and who fulfills all the desires of the prince of Vraja, Sri Krishna — always bestow upon me the service of Her lotus feet! May that Sri Krishna, son of the king of the cowherd men — who pleases Srimati Radhika and the cowherd maidens with the nectar of His pastimes in the forest groves and in the circle-dance, who nourishes them with His jokes and tricks, and who delights the hearts of everyone with His supernatural love, character, playfulness, and fame — bestow upon me the service of His lotus feet! May that Srimati Radhika — whose softness defeats the fame of delicate budding flowers, whose body's coolness is worshipable for the moon, sandalwood-paste, the lotus, and camphor, and whose touch dispels the heat of Sri Krishna's amorous desires — always bestow upon me the service of Her lotus feet!" In the wake of these prayers, Gaudiya Vaishnavas aspire to personally serve the Divine Couple in their amorous pastimes in the role of Sri Radha's manjaris (handmaids), assisting Them in various ways in the fulfillment of Their love.